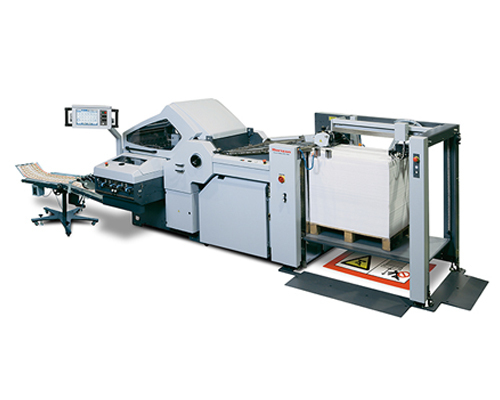 The Standard Horizon AFC-746F Large-format Folder includes advanced set-up automation through a user-friendly color touch-screen control panel that displays all common fold formats and sheet sizes for easy selection. The folder features quick changeover and fully automated setup with up to 47 automated adjustments including in-feed, roller gap, buckle fold, and knife-fold sections. The AFC-746F is very flexible – with 6 buckle plates + 1st knife + 2 buckles under the knife, one buckle standard + 2nd knife. It handles sheet sizes up to 29.1” x 43.3” and as small as 8.27” x 11.695” with programmable memory for up to 200 different jobs. It includes a pallet pile feeder with suction head. The AFC-746F also contains a new ergonomically friendly slitter shaft removal system, where the operator can remove the perforation shaft automatically for easier blade setting – a quick releaser lever, internal elevator, and slide out carriage highlight this new feature.